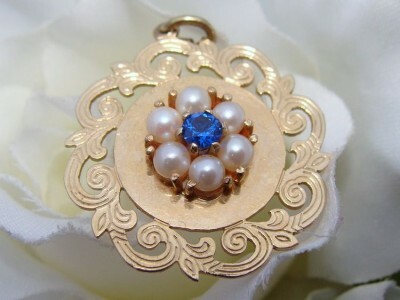 A gorgeous Antique Vintage pendant crafted from solid 14 carat Yellow Gold with engraved detailing and a rosette of creamy, lustrous pearls studded with a prong-set sapphire at the centre. 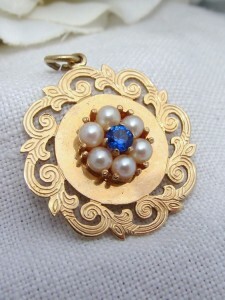 Included is a new-old stock vintage Gold Filled chain so it is ready to wear. It has that lustrous silky smooth feel of solid 14 carat gold to be expected of quality antique/vintage jewellery with a a yellow gold hue tinged with pink. Near MINT Antique condition! There is nothing about it that detracts in anyway - no wear, dents or damage - its condition belies its age. What WOW factor! 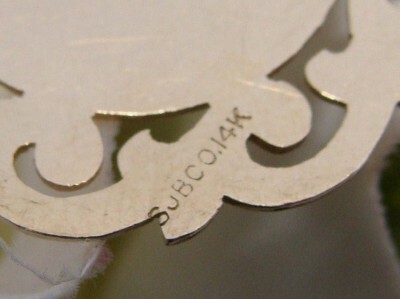 A fabulous treat for you or someone special as a prized addition to any jewellery collection!